Pakistan and Afghanistan must intensify efforts to halt spread of the crippling poliovirus, including better screening of travelers heading abroad, the World Health Organization said on Monday. The WHO emergency committee of experts warned in a statement that vaccinations of international air travelers in Afghanistan are not being tracked "and no exit screening and restriction of unvaccinated travelers has been implemented at international airports." "The increasing risk of international spread associated with the ongoing suspension of mass vaccination campaigns in Kandahar province was another major source of concern," the U.N. agency said, referring to Taliban factions that have halted vaccination campaigns. Pakistan and Afghanistan - the only two countries where the poliovirus remains endemic - have reported 29 and seven cases, respectively, so far this year, against 108 and eight at this time in 2014, WHO spokeswoman Sona Bari said. 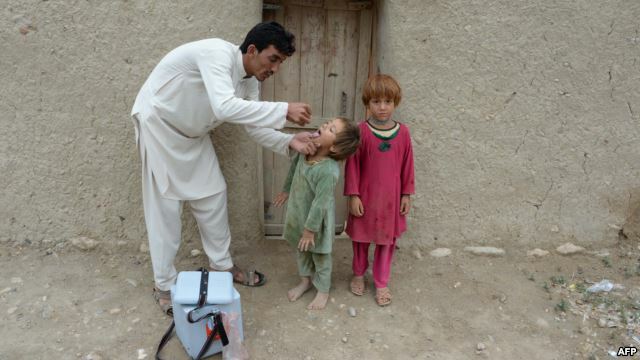 The experts, while recognizing progress in Pakistan, said that Afghan and Pakistani residents lacking documentation of recent polio vaccination should be restricted "at the point of departure," whether traveling by road, air or sea. "The committee recommended that coordination and quality of cross-border vaccination and surveillance activities should be further strengthened to reduce the risk of this international spread. Both countries must achieve interruption of poliovirus transmission simultaneously in order to prevent such international spread from repeatedly setting back progress." India, which had its last case in 2011, was certified polio-free three years later. The poliomyelitis virus attacks the nervous system and can cause irreversible paralysis within hours of infection. It often spreads among young children and in areas with poor sanitation. In Africa, no cases of wild poliovirus have been reported since Somalia on August 11, 2014, Bari said. Nigeria marked its first year without a single case on July 24, reaching a milestone many experts had thought would elude it as internal conflict hampered the battle against the disease. Hot spots in the Middle East, the Horn of Africa and central Africa, particularly the Lake Chad region bordering Nigeria, remain vulnerable to polio, the WHO said: "The hard-earned gains can be quickly lost if there is continued disruption of health systems." Madagascar has had nine cases of vaccine-derived poliovirus this year, against one in 2014, Bari said. The outbreak stems from a "very rare mutation" of the virus into a paralytic form after passing through the stool of a person who has had the oral vaccine, usually into an environment with low immunity, she said.